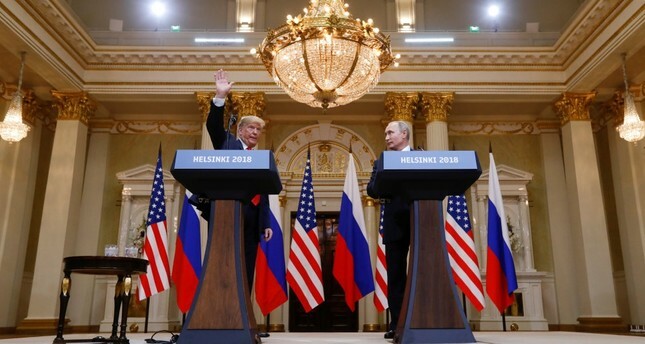 U.S. President Donald Trump (L) waves after a joint news conference with Russia's President Vladimir Putin following their meeting in Helsinki, Finland, July 16, 2018. The early days of 2019 saw the United States withdraw from the Intermediate Range Nuclear Forces (INF) Treaty that was signed in 1987 by Washington and Moscow as part of their efforts to ease Cold War era tensions. Given that the end of the Cold War era confrontation between the two power blocks was based on the understanding that the parties would gradually limit, if not completely demolish, their nuclear weapons capability, the latest decision of the Trump administration to unilaterally suspend the INF Treaty would likely help escalate the ongoing geopolitical tension between the countries. Is the world now heading toward a new Cold War? Is the crisis over the INF Treaty the latest episode of the emerging great powers competition, reminiscent of the Cold War era? The accusations leveled against Vladimir Putin's Russia were that in fact it was Russia that had been violating the terms of the INF Treaty for some time by developing its short and medium-range ballistic missile capability and deploying them to close proximity to Europe. To this reasoning Russia had not been content with the attempts of the so-called Western international community at enlarging its sphere of influence to Russia's borders and Russia could only deal with the alleged Western encroachment on the Russian sphere of influence by dint of improving its non-conventional military capabilities. Given the widening power gap between the West and Russia, Russia would not be able to hold off Western incursions to its sphere of influence through the economic and conventional military capabilities at its disposal. Since the early years of Putin's presidency Russia has been continuously updating its strategic security concept in such a way to lower the threshold of using nuclear weapons at earlier stages of military confrontations. Adhering strictly to the terms of the INF Treaty or other arrangements that are supposed to put strong limits on Russia's non-conventional military capabilities would therefore be viewed lukewarmly by Moscow. That said, by suspending the INF Treaty, the Trump administration might have wanted to give the signal that Russia would never compete with the United States in the realm of military armament. By pushing Russia to increase its defense expenditures, the United States might wish to sway over Russia by setting in motion a costly armament race, reminiscent of the "Star Wars" or arms race during the 1990s. One can alternatively make sense of the American decision to suspend the INF Treaty in the context of never-ending American efforts to build a ballistic missile defense capability shielding the American homeland against any missile threats from any direction. Were the U.S. to acquire this capability, which many nuclear scientists and military experts think unlikely given the current technological sophistication, the INF Treaty or other arms-reduction treaties would automatically drop off the agenda, for no particular country would be in a position to seriously attack the United States. This brings us to another point in this saga, which is the growing determination of the U.S. to help contain, if not completely eliminate, the surging Chinese military assertiveness in the East and South China Seas. The logic that applies to American perception of the Russian threat also makes sense in the context of the American view of China. Indeed, some foreign policy pundits have opined that the real target of the American decision to withdraw from the INF Treaty was China. China's galloping military budget and adoption of the anti-access/area denial military strategy appear to aim at limiting the American footprint in East and Southeast Asia as well as paving the way for Chinese hegemony in its neighborhood. The "pivot" strategy of the Obama administration, which was later renamed as "rebalancing," put the containment of China's regional ambition in East Asia at its center. The restructuring of the American military strategy in line with the Air-Sea Battle concept was also intended to null China's improving military capabilities. For the United States to check China's military prowess, the development and deployment of short to medium-range ballistic missiles in the regions surrounding China's mainland would likely prove useful in the years to come. This seems to account for why the United States wanted to break free of the shackles and strict limitations of the INF Treaty. Such developments on the ground demonstrate that great power relations have been going through difficult times recently. This is the exact opposite of what many foreign policy and international relations experts expected to occur following the end of the Cold War. With the triumph of liberal democracy, the acceleration of the globalization process and the emergence of the United States as the sole global hegemon policing the earth, history would soon come to an end; the possibility of great power competition would diminish; and different parts of the globe would converge on the ideas of universal human rights and irreversible progress. The trade restrictions that the Trump administration adopted toward China and other countries, which it thinks take advantage of free trade, as well as the sanctions that it put on Russia in the wake of Russia's policies in Eastern Europe and the Middle East should be considered as the latest stage of a particular chain of developments proving the early post-Cold War era expectations wrong. Likewise, notwithstanding the critical discourse that President Trump adopted vis-a-vis NATO and European allies, the American contribution to NATO's resilience and reassurance capacity has dramatically increased over the last couple of years. NATO has recently admitted its 30th member, North Macedonia, and American troops are now deployed in many central and eastern European ally countries. The efforts of the current U.S. administration to help bring into existence a NATO-like security organization in the Middle East, the so-called Middle East Security Alliance, and push the traditional allies in Asia, namely India, Japan and Australia, to join forces with the United States in containing China are of the same cloth. The ultimate purpose of such American initiatives seems to help protect Western geopolitical interests across the globe against Russia and China's strategic intrusions. Unlike the previous eras, the Trump administration is trying to secure the United States' global primacy by continuing the Obama administration's offshore balancing strategy, according to which the U.S. would do well to push allies to take up more responsibility in sharing global burdens. Too late to wake up? Today, a new Cold War environment has already set in as the practices of geopolitical thinking and realpolitik calculations are being fervently adopted by many countries all over the world. In today's world none of the global powers appear to believe in the idea that we are on the cusp of a universal community of mankind in which long-term interstate cooperation would be taken for granted. The contours of what passes for universal human rights and appropriate interstate behaviors have fast become opaque. The latest indication of the emerging normative contest over the definition of appropriate interstate behaviors is the tug of war between the two groups of countries that lend support to opposite sides in Venezuela. If such trends cannot be stopped immediately, the years ahead will likely see great powers continue to compete with each other, both normatively as for the constitutive principles of the emerging world order, and materially as for the distribution of power capabilities across the globe. This is not good.